Let’s be honest pretty much everything was better in the past. Music, fashion, football even sweets. Perhaps there’s a bit of a renaissance going on there too. The tumbling reels, cluster pays, multiple-bonuses and megaways may just have been enough to send some of us running for the solace of familiarity. That certainly helps explain why we love this game so much. 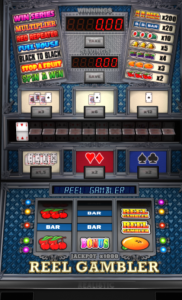 Reel Gambler (see even the name is retro) is a 3 reel pub-style slot (fruit machine would be more apt) from Realistic. Realistic have avoided going too far into the pub fruity world, they’ve just gone crazy these days anyway. On a recent trip to London with Swedish colleagues they were in awe of the range of options, features, choices, gambles and general mayhem of pub fruit machines. Reel Gambler takes a more sedate approach and it’s none the worse for it. The base games is a standard 5-line setup with the addition of bonus symbols. Any win can be multiplied between 1.5x and 12x. There’s a nice little “save” feature which allows you to collect any part of your win balance and gamble on with the remainder. Any win triggers the gamble option and a Bonus win will send you to the bonus ladder. 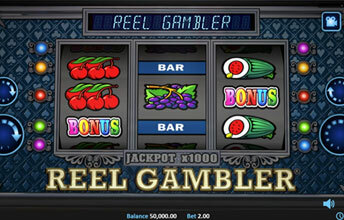 Realistic have overcome the screen limitations nicely using a zoom in feature when the player enters the bonus ladder. If you’re a purist you can of course play in cabinet mode just like down the pub but it’s not that easy to see everything with that view. Spin A Win – A single guaranteed win award. Stop A Fruit – A single fruit is randomly selected and a win from that symbol is awarded. Full House – awards a spin with reels containing just one random symbol. Red Repeater – As with back to Black but round ends on a black. 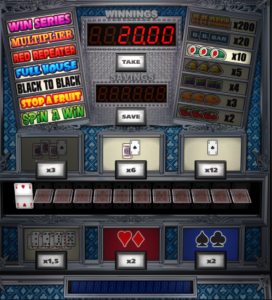 Multiplier – Guaranteed win with a multiplier up to 10x. Win Series – A win streak. As you will see from our video we had great fun playing this. It’s definitely going to be a game we will return to frequently during our daily live streaming! We’re not calling for a wholesale return to the past of course but when things are this well made and the mechanics are so good it’s not so much nostalgia as a welcome respite.